TL;DR – Buffer, one of the best tools for social media, rolled out a new feature today that makes Pinterest marketing a lot easier. It’s no secret that I really, really love Buffer. It’s one of my most important tools in promoting my site. There’s no easier way to automatically share great social content on your follower’s optimum schedule. It’s a must-have in the toolbox of any digital marketer (and a fantastic way for small business owners to have a better social media presence in much less time). Now, Buffer has added support for Pinterest. If your brand is especially visual, such as those selling food or fashion, this could be a very exciting update. I won’t bore you with details here; you’re either interested because you use Pinterest (or you’re thinking about it), or Pinterest simply isn’t for you. No worries – I don’t reach my audience through Pinterest. 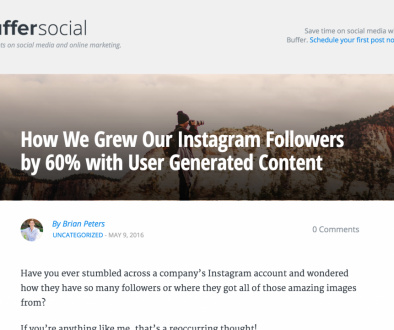 …Then get on over to the Buffer Blog and read about how their new feature can save you hours of time while improving your marketing.